Compared to other pests, crows are a little hard to work on. They come around as a group of families rather than individual birds for self feeding. In other words, you are most likely going to deal with more than just a single black bird. Good thing, we’ll learn some easy ways on how to keep crows away. There are several solutions against crows. Remember that these creatures are smart and clever. They are voracious as well wanting to eat more. That’s why it can help if you get rid of leftovers, composts, pet foods and other rubbish they may consider as food sources. Nevertheless, these are the things you need to do when dealing with crows. Check out the area for trash. You need to get rid of them as these can attract crows along with other garden pests, such as ants and worms. Every bin should be checked if it needs to be emptied and remove anything that easily composts. It also helps if you notify each family member to properly dispose their garbage. One of the most common, and probably the most traditional, strategies concerning how to keep crows away is the use of scarecrow. Even up to these days, you can see huge farm with at least one scarecrow. It can be a human shape, a Halloween decoration, and other large bright colored stuff hanging outside. Crows are somewhat scared of anything bright and reflective. Noises are also a great way to use regarding how to keep crows away. Any kind of noise from screams to fireworks to sirens can scare them off. Just be sure that these won’t annoy or upset your neighbors. A very ideal choice would be some tin cans or metal hanging around and when blown by wind it creates a clicking sound. It’s not that but if close enough crows won’t bother landing in your farm or garden. The most advanced tool is the ultrasonic crow repellent. People can’t hear these but the sound waves are effective in frightening or annoying crows. The more crows are expected if your trees or plants produce fruits. These are obvious foods to them so how do you protect those and how to keep crows away at the same time? Simple, cover the fruits or vegetables with old newspapers or non-toxic plastic wraps. Make sure that there’s plenty of space for the fruits to grow and ripen. Nonetheless, you have to collect or harvest them before pests like crows get them first. What most gardeners use these days to protect their plants and fruits is using a greenhouse. This doesn’t have to be enclosed. You can leave some holes to have air as well as sunlight to go through. As long as crows can’t reach the plants is fine. Bird netting is a great way to cover your plants and further protect them from pests. This is definitely a great option on how to keep crows away. It may be a little work installing them if your garden is huge but it’s worth it. A more sophist acted device that you can use on how to keep crows away is a trap intended for birds. There is the bird spike that you may place on top of each wall or fence. However, this can be dangerous to young children and other pets so install them in an unreachable place. Another bird trap is a crow trap, which you can buy or build. Purple martins are beautiful birds that do not only add attraction to your garden but also reliable in scaring crows. They have the natural habit to chase crows so having them around can be an extra help. Don’t worry, they don’t feed on plants but make sure you eat them regularly with proper foods so they won’t turn on the fruits of your garden. As mentioned already, crows can be really smart. If you’re using the same tactic on how to keep crows away, they may learn the truth eventually. You better use one strategy for the first 3 months then change. 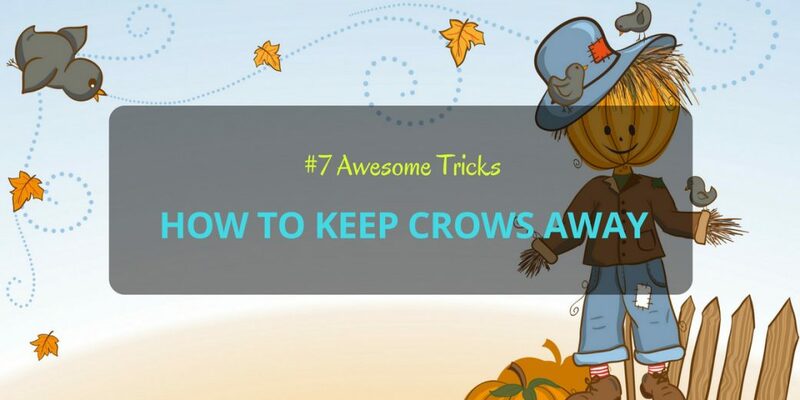 All these 7 suggestions are great solutions regarding how to keep crows away. You may use one or two of these tips to further add protection for your plants.